RUSH: You know, ladies and gentlemen, how over the many years of this program incidents happen and I make jokes about these incidents, and then eventually making a joke about something that’s ridiculous and absurd actually happens. Someday down the road, the Democrats or leftists and liberals, not just here, but around the world, do it. RUSH ARCHIVE: According to the FBI, knives kill far more people than rifles in America. And it’s not even close. Recent stats from 2016 show that knives kill five times as many people as rifles in 2016. According to the FBI, 1600 people were killed by knives and cutting instruments, 374 were killed by rifles in 2016? Where’s the sense of proportion here? Of course, that’s why this is politics. I mentioned this to illustrate how it is political. There is no knife control movement. 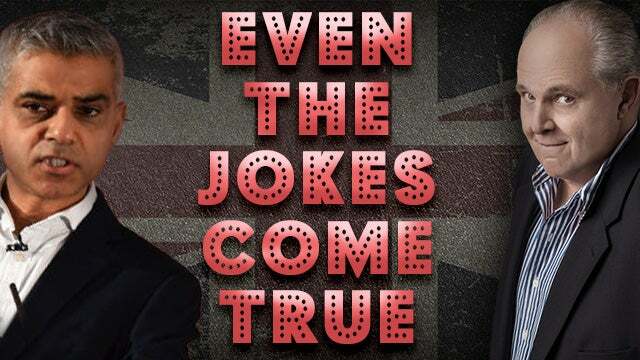 RUSH: Yes, there is. There is a knife control movement in London. The mayor of Londonistan has declared an intense new knife control policy to stop the epidemic of stabbing. You see what they’ve done over there, they’ve started banning guns and they’ve been doing that for the longest time and so now people are stabbing each other. And here comes this novice leftist mayor, after an epidemic of stabbings and acid attacks in London has gotten so bad that the London mayor, Sadiq Khan, is announcing broad new knife control policies. I saw this today, this has to be an Onion story, this has to be a satirical post, this can’t possibly be true. And then I said, wait a minute, it has to be true, and this is exactly what happens. The leftists do stupid stuff all the time. And their stupid stuff they don’t think is stupid, they think it’s brilliant; it ends up infringing on the rights of everybody. And it never gets to the nuts and bolts of the problem! Guns in the hands of law-abiding people — sounding like a broken record — are not the problem. Neither are knives in the hands of law abiding people. Never mind that. There needs to be something done because people are being stabbed so we’ve got to proverbially do something. And so the mayor of London has announced broad new knife control policies designed to keep these weapons of war out of the hands of Londoners looking to cause other people harm. “The tough and immediate measures involve an incredible police crackdown, a ban on home deliveries of knives and acid.” Mr. Snerdley, how many home deliveries of acid do you receive in a — (interruption) you’ve never ordered any acid from anywhere? What about you, Brian? I mean, you’re an engineer. You deal with stuff — (interruption) You go to Home Depot if you want acid, but you don’t have it delivered? All right. (interruption) You get it from where? You put acid in your swimming pool? I don’t even want to — (interruption) Oh, that. Well, that’s not the kind. We’re talking about the acid that melts people. We’re talking about the acid that melts people’s skins. You don’t traffic in that, right? You don’t go to the Home Depot for that? (interruption) Okay. I don’t know how many people have acid delivered, but if you live in London and have acid delivered that tough as nails mayor has just shut it down along with no new knife deliveries. 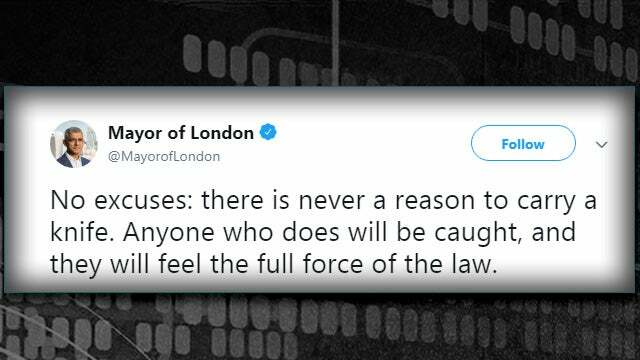 Not only that, the mayor of London is gonna expand law enforcement stop-and-search powers so that cops can stop anybody they believe to be carrying a knife or a vat of acid. He announced Friday the city’s created a violent crime task force of 120 officers tasked with rooting out knife-wielding individuals in public spaces. He’s pumping near $50 million into the metropolitan police department so that they can better arm themselves against knife attacks. How do you do that? That’s what I’m saying, how do you stop a knife — how do you arm yourself? Traditionally that kind of language means guns. He’s also empowering the metropolitan police to introduce targeted patrols with extra stop-and-search powers for the areas worst affected. Where are those areas? I have to tell you, that’s where women and minorities and the poor hang out. And so the cops are being given extended powers for the worst affected areas. This mayor took to Twitter to announce his new policies. Strangely enough, Khan is responsible to decreasing the number of stop-and-searches, having previously declared the tactic racist and potentially Islamophobic. It’s not clear what local Londoners will now use to cut their food. Why do you need a knife to cut tofu? I mean, what do they eat now, with the animal rights people succeeding and the global climate change people succeeding? I mean, what the hell can people eat over there now as it is? I guarantee you, it ain’t Yorkshire pudding. And I guarantee you it is Beef Wellington, which is delicious. If somebody knows how to fix Beef Wellington, you eat it. I mean, it just to die for. Parliament is also set to take up heavy knife control legislation when it resumes this week. Now, you see, we joke about this, and at the same time making a point because the stats are true. The number of people killed by stabbing is far greater than the number of people killed with guns. Plus, the number of people killing themselves with knives is infinitesimally small. And you know why? Because you do not die instantly. You know what has happened. You know what you did to yourself and you have to sit there and suffer through it and with it and then you may not die if you goof up your own stabbing. With a gun, pretty much the last thing you know is the second before you pulled the trigger. But a knife hardly ever is it used in suicidal circumstances. But where does this end? You see, folks, what we’ve learned now, those of us willing to accept it, is that none of this is ever an end to anything. All of these measures that the left comes up with are simply starting points for new phases and if we’re being honest about it, we have to tell ourselves it’s not just guns that hurt people and it’s not just knives that hurt people. Words can too. What do you think is next? If they’ve got some crack pot actually willing to seriously propose and enforce knife control, can word control be far behind? I would submit to you that we’re in the early stages of word control as it is. RUSH: Just mark my words. It’s not gonna stop at knife control. It’s going to end up being word control. I know you’re thinking, “Rush, we already have that, political correctness.” Yeah, but it’s gonna get worse. If we don’t stop it, it’s gonna get worse. If we do nothing, it’s gonna get worse, mark my words. They’ll come up with new ways we haven’t even thought of and ways we have to suppress speech. And we’ll sit around and marvel that anybody could think of such things while they all do it with the help of their media.